I have to give you some back story first before I get to the classroom part. I have to show you how precious this issue is to me. I'm definitely a feminist. I was probably a feminist for a long time but I claimed the word in college when my friend Tracy and I put on a Women's Week- a week of events at our college focused on women's issues. I got to know Mr. Husband during this week when he volunteered to help out. I know you cynics are raising an eyebrow and thinking, "Oh sure, he wanted to "help out" with Women's Week." You're thinking he volunteered because he wanted to get close to me. I stand by the truth that he was and is a solid feminist himself. However, I just asked him about this. Did you want to help with the week because you believed in the cause or you wanted to kiss me? I don't remember, he said, probably both. Ah, well.....good enough. One more family story- A few months ago I was driving with my 16 year old son. I'm not sure what we were talking about, but somehow the topic of feminism came up and he casually referred to himself as a feminist. I had to grip the steering wheel, because in that moment it was like the heavens parted and the angels started to sing. I had raised a boy, a 16 year old, who called himself a feminist. I could die now with that achievement. In fact, I told this story a few weeks later to my dear friends, Amy, Cathy, and Wendy at dinner and they were so excited and proud that they toasted me! 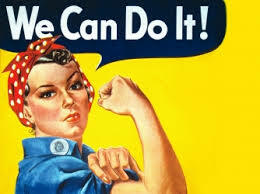 Okay, you get the point- so feminism, equal rights- very important to me- a core value in my life. Fast forward to my classroom now- full of kids from all over the world, many from places in the Middle East that have very different notions of a woman's place in the world. Usually, I think about this more with the girls from the Middle East. The majority are here temporarily. They come here and they wear skinny jeans and they don't cover their heads and they have classes with boys and it all kind of blows my mind. I wonder how hard it might be for them to return to their countries and resume their roles there. Some have talked about it. Some have said they prefer life here and the way women are treated. Kind of surprisingly, the Middle Eastern boys normally adapt pretty well. I think they know ahead of time that they're going to be in school with girls, have female teachers, that things are very different here. I know they have different thoughts on the whole issue but for the most part, they go with the flow. Enter Student N. this past winter. Yea, not so much for going with the flow. He had very little English and so I was going slow with him anyway. During Math, we work in small groups and I asked him to come sit by me so I could assess where he was and work with him. I used simple language and pointed at him and the chair next to me and waved him over. He shook his head. I tried again, this time with a big smile. Head shake. Okay, maybe he's not getting it. I asked a student to go explain to him in Arabic what I wanted. I watched the interaction out of the corner of my eye. I saw a 3rd head shake. I asked my student interpreter what Student N. said. My interpreter looked really uncomfortable. He didn't want to say. I told him to just give it to me straight. "Umm, well, uh, Miss, well he said that, um, he can't sit by you or work with you because you're a woman." A little part of my head exploded but I keep it under control and I said to my student interpreter, "Well, okay, I'm sure this school is very different for him and I can understand that. But, I am his teacher now so we'll have to find a way to work it out. Can you tell him I said that?" Student interpreter delivered the message to student N. Who did, Guess what? SHOOK HIS HEAD. His favorite thing, I think. I let it go in that moment, because, baby steps, right? And, besides, I was really busy with other needy students who were practically sitting on top of me, begging for help and attention. Later that week, my colleague had a similar interaction with Student N., but she went all in. All in with her gentle way. Dealt with it head on. She told him she knew that this set-up was new, different, and strange. She talked about her own experiences being a newcomer in both Germany and the U.S. She reached out, she commiserated, but she also held the line... She is his teacher now. I am his teacher now. We deserve respect. He didn't shake his head this time. He looked pretty skeptical, but he didn't shake his head. I think he even smiled a bit and he had a nice smile. Student N. didn't stay long in our program. He was difficult. He was challenging. He came around a little, but not a lot. We tried hard with him. I wonder sometimes if we made a dent in his opinions about men and women. I wonder if anything we said or did had an impact. I thought about our conversations and interactions with him and wonder what I could have done better or differently. I wondered what was most effective. Then, I actually remembered one thing I saw that seemed to work with him one day. We play chess every day in our program. One day his partner was a girl. He didn't want to play a girl. He did the head shake thing. His opponent, (sweet girl from Central America) looked like she wanted to punch him. We were tyring different things to convince him to play her. We were going soft, then we were being firm. I know you're not supposed to get in power struggles with students, but I was ready to go down in flames to win this one. On this particular day, I had enough of this particular issue, and he was going to play chess with this particular girl. Finally, one of his buddies went up to him and said a bunch of stuff in Arabic and then he clapped him loudly on the back and said, "You in America now, man!!!!" Now, why didn't I think of that???? Then Student N. smiled and played chess with the girl. And lost. Ouch.